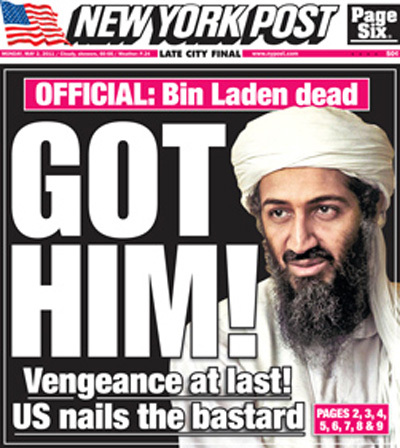 You would have had to be living under a rock not to notice that the death of Osama Bin Laden was announced last week. There was an amazing amount of drama and speculation in the moments leading up to the announcement. I have to honestly say that as the news broke, my initial reaction was one of elation. Something primal welled up from deep inside me and I immediately said, “Yes! Finally he got what he deserved! Justice is served! But almost immediately I was convicted and my response changed. All of a sudden I felt a different reaction, one in all honesty that confused me; one that I couldn’t really articulate. The initial exuberance I felt was replaced by a sense of uneasiness and even of type of sadness. Then I saw videos of Americans dancing in the streets, celebrating the death of Osama. Then I saw numerous facebook posts by professing Christians celebrating his death. When I saw all of this, I got a sick feeling in the pit of my stomach. When I saw American people dancing in the streets in celebration, my mind immediately flashed back to the videos of Arabs dancing in the streets in celebration after the attacks of 9/11. When I saw the facebook posts I began to wonder if this kind of celebration is appropriate for people who profess to be followers of Jesus. “But wait a minute Fred, doesn’t the Bible say that God uses human governments as an implement of His wrath?” Yes, absolutely it does. In fact, the are numerous examples in the OT where God brings other nations into Israel or Judah specifically for the purpose of exercising His judgment against the wickedness of the people. Rom 13:1-5 – Clearly, the state can function as God’s implement of wrath. The problem is, it is not always clear whenthis is actually the case. In the historical context of this passage, who was the primary governing authority Paul was referring to? Rome. So can we deduce that every time Rome wielded the sword that it always resulted in an act of divine justice?I can think of at least one case when Rome executed a man and it was completely unjust. In fact, Pilate knew that Jesus was innocent of any crime that would be deserving of death, but he ordered the execution of Jesus because of his own political fears. Even though we live in a country that is firmly committed to the separation of church and sate, have you ever noticed how the lines seem to so easily get blurred? Have you ever noticed how in the American church we seem to overlay American politics on the kingdom of God? Republicans and Democrats both have positioned themselves as the party of God over the years, for different reasons. Republicans because they oppose abortion and gay marriage, Democrats because of their social justice agenda. I would like to just point out that there is no political party or human government that functions as God’s representative on earth. If we are to understand the fullness of what the Bible teaches about vengeance, we have to put Rom 13 squarely within the context of Rom 12. Rom 12:14-21.We must never succumb to the temptation of seeing the enemy of the state as the enemy of the church, and even if the two do overlap (when the enemy of the state is in fact an enemy of the church), we must be diligent not to respond to enemies of the church in the same way that governments respond to enemies of the sate, because the Bible calls Christians to something that is radically different. “So are you asking me to feel sorry for a guy who murdered thousands of innocent people?” No, I am not asking you to feel anything. I am just asking you if whatever you may feel is appropriate from a biblical perspective. Why do you suppose that people love vengeance so much? Why do we love to see bad guys get what is coming to them? Is it because we are evil? I would say that the fundamental answer to that question is “no.” I think people love justice because God is just and we are made in His image. The real question is, what should our emotional response be when people perish apart from Christ? We love to see justice served. But has it ever occurred to you that this is only the case insofar as it relates to others? The paradox is, we demand justice for others, even while we plead for mercy for ourselves. I don’t know anyone who wants to receive absolute justice for the things they have done. So what is the appropriate reaction? I think we need to gauge our reaction based on God’s reaction. In other words, how does God feel when the wicked are destroyed? Ezek 18:21-32. What then should followers of Jesus do? When we have one of those “Yes! He got what he deserved!” moments, we need to ask ourselves this question: “Have I? Have I gotten what I deserve? Will I ultimately get what I deserve?” You won’t like hearing this, and some of you may not even believe me, but just allow me to suggest that all of us have more in common with Osama Bin Laden than we do with Jesus Christ. And without God’s grace on our lives, each of us would be perfectly capable of committing the same kind of atrocities that he has perpetrated against humanity; perhaps even worse.But that’s why the good news of the gospel is so profoundly good! Because of our sins, we all deserve separation from God and an eternity of torment in hell. But when we have faith in the death and resurrection of Jesus, when we receive Jesus as Lord and Messiah, we also receive forgiveness for our sins and are spared that fate. In fact, not only are we spared the fate that we deserve, we are given one that we don’t deserve: resurrection to life everlasting and eternity in the immediate presence and glory of God. If we take joy in the fact that we are spared what we deserve and given what we don’t, how can we possibly take pleasure and delight when others perish apart from Christ to suffer an eternity in hell? Isn’t that the purest definition of hypocrisy? Rather than taking joy in the death of the wicked, shouldn’t we rather mourn them. Shouldn’t we rather mourn the fact that they were deceived and deluded? Shouldn’t we rather mourn the fact that they either rejected the gospel or never heard it? Mt 5:43-48– Here is the hard truth: if we are going to follow Jesus we must follow Him in treating our enemies the way He treated His enemies. Rather than reviling and despising them we must pray for them, following in the footsteps of Him who prayed for those who nailed Him to the cross saying, “Father, forgive them, for they know not what they do.”Let me just encourage you this week to take time to pray for your enemies (enemies of both church and state), let me encourage you to pray for those who have not yet been changed by the life-transforming power of the gospel.Let us be thankful that by God’s grace we live in a country that affords us freedom to worship according to the dictates of our conscience. More importantly, let us be thankful that God is just, but also let us be profoundly thankful that He has offered us an escape from the eternal justice we all deserve.